Time does not seem to be on my side at the moment. And I apologize because I do not have much of a post today because I am in the midst of traveling across the US. Though I am having the most amazing time of my life at the moment, my writing is suffering horrible. I have not been able to abide by Phil Giunta’s time management tips from his guest post. The launch of Somewhere in the Middle of Eternity went perfectly last Friday night. And it was so much more than just a perfect night. It was the most amazing experience of my life. I cannot even begin to describe how wonderful it was seeing the interest in people’s faces as they picked up the physical copy of our anthology. Seeing that was breathtaking. Also, to spend the entire weekend among writer and talking non-stop about writing. Pure heaven. Finally, as an update for Somewhere in the Middle of Eternity, for anyone who has been scouring Amazon, Smashwords, etc. for it… the anthology has unfortunately not yet been posted to any online site for purchase. Though it officially launched yesterday, apparently a publication takes a few days to appear on online retailers. The physical books should be available for purchase sometime this week. I will make another post as soon as that is available. The electronic copy may be available next week. So keep tuned in to this blog or my Horror blog for updates. My sincere apologies to anyone who spent hours on Amazon yesterday, refreshing their page every 5 minutes in a hopeless search to purchase Somewhere in the Middle of Eternity. This entry was posted in Announcements and tagged Amanda Headlee, Phil Giunta, Somewhere in the Middle of Eternity, Susanna Reilly. Bookmark the permalink. 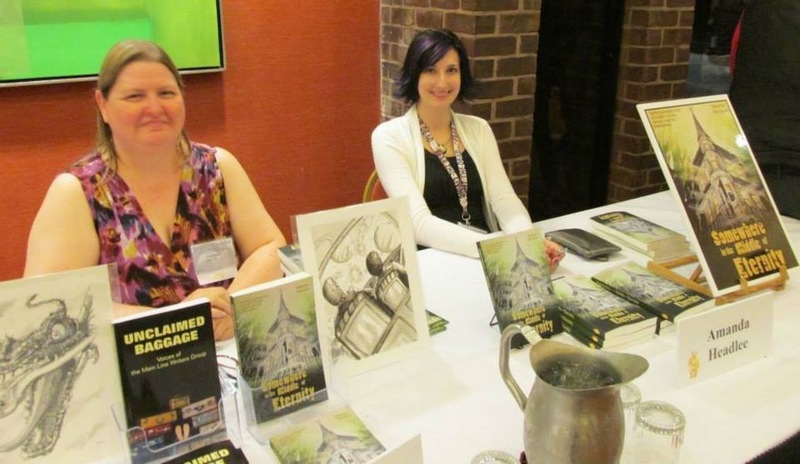 It was indeed a phenomenal book launch and I am thrilled that you had a great time at Shore Leave, Amanda!